This review is a bit of a work in progress and I intend to write a few more posts about the film over the next few weeks. Still it seemed important to get something down whilst it's still in cinemas, not least because I didn't want to leave it three years like I did with Noah. Arguably the three most influential religious films of the last century were Dreyer's Passion of Joan of Arc (1929), Pasolini's Il vangelo secondo Matteo (1964) and Jewison's Jesus Christ, Superstar (1973). It's perhaps not surprising, then, that Mary Magdalene, a films so heavily invested in its visuals, evokes these three films again and again. Just as Dreyer's film is dominated by Falconetti's face as he transforms Joan into something of a Christ figure, so director Garth Davis focuses on Rooney Mara's features as he shapes Mary into a far more compelling figure than the man she is supposedly following. Both Mary and Pasolini's Gospel of Matthew were filmed in Matera where the jaggedness of the buildings and landscape contrasts with the smooth round shapes of shawls clasped tightly round the heads of their wind-battered owners. And then there is Superstar; Chiwetel Ejiofor frequently channelling Carl Anderson's scowls and glares, his charisma and masculine self-belief, and his bristling bewilderment at the way the movement he loves is drifting off course as their scruffy-looking leader is drawn towards Mary (Rooney Mara). Yet for all the ways in which it mirrors these twentieth century films, what makes Mary Magdalene interesting is its twenty-first century sensibility. 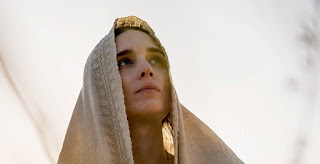 As the title suggests, this film is not primarily about Jesus, but about one of his most important followers, Mary Magdalene, and whilst it's not the first film to tell the story from her perspective, it's a worthy attempt to liberate her from both the church's labelling of her as a prostitute, and various dramatists portrayal of her as Jesus' potential love interest. That it does so is thanks, largely to Helen Edmundson and Philippa Goslett's script which picks up the story in Magdala, where Mary still lives with her father. When she heads into the village synagogue to pray one evening, the town's religious officials worry about her demeanour, whilst the men of her family feel that she has disgraced them. The two groups of men take it upon themselves one evening to try to literally drown out her demons and then seem at a loss about what to do when she appears traumatised by the experience. And then, "The Healer" arrives. Jesus turns up, sees the core of who Mary really is. He soothes her and brings healing to her badly bruised soul. Little wonder, then, she decides to flee her over-bearing and violent family to follow him. Jesus, welcomes her presence, not least because she seems to understand both him and his message better than the male disciples do. They talk about a war that he has no interest in; she talks about "what it feels like to be one with God". No-one has ever asked him that before. She is able to gently point out the ways his approach is, apparently unintentionally, making it hard for women to get involved. She encourages him to preach in the parts of the town where the women gather and points out how "The women are too afraid to be baptised with the men" (hardly surprising given Mary's family's attempts at exorcism by submersion in water). What's interesting about Edmundson and Goslett's script is not only the way it never forgets it is about Mary, and not Jesus, but also the way it finds small, out of the way, elements in the gospels to elaborate upon. It does this in order to enrich its theme whilst simultaneously retaining its respect for the source material. It's noticeable, also, how these scenes often show the moment itself, rather than the predefined package we're presented with in the gospels. In one scene Mary and Peter are travelling on their own to spread the message, but there's no build up to the scene preceded by Jesus makes a speech about them going out two by two and how they are to do it. We simply join them on the road as they are doing it. And here Peter learns about the importance of mercy which clashes with his pragmatism, but comes so very naturally to her. Similar in this respect is the scene where Jesus raises a man from the dead. It's not entirely clear if this is Lazarus or the widow of Nain's son? It has elements of both, but focuses less upon the broader meaning and theological significance of the moment and more on the experience of it. Naturally enough the narrative ends up in Jerusalem, but the sometimes endless scenes where Jesus is dragged from one patriarchal leader to another are not included, but it's handled so skilfully that it honours the significance of these events without losing its balance and focus. Indeed, the film's gentle pacing, Hildur Guðnadóttir and Jóhann Jóhannsson's haunting score and its lingering shots of ruggedly beautiful landscapes stay with you long after the film. Yet for all these strengths I never quite found it as satisfying as I'd hoped. Whilst the sensitivity and spirituality of Joaquim Phoenix's Jesus is welcome, he seems to lack passion and drive, instead coming over as more stoned than inspired. It's not hard to work out what Mary believes in, nor what the film stands for, but as to what Jesus' message is, it's hard to tell, He has a series of good lines, but brought together they add up to very little aside from a potentially popular Instagram feed. Whilst it's hardly surprising that the film has been far better received by women than male critics, I wonder if this is mainly because Jesus is a far less well rounded out and defined character than Mary. Mistaking Jesus' lack of passion for that of the film as a whole is easy to do when the character you most naturally relate to is somewhat weak. But whilst male critics shouldn't let the film off for that, we should recognise that the reason we are so attuned to it is because in almost all other cases the shoe has been on the other foot. We've been treated to numerous well-rounded, interesting depictions of Jesus, accompanied by only cardboard cut out portrayals of the female characters in the story, if they are even there at all. Indeed, taken as a whole, this film is passionate, it's just Mara's Mary who is carrying it and embodying it, all the while skilfully navigating the rocky path between being seen as either too pushy or too passive. The film's Mary is neither. She's an advocate for change in the name of inclusivity - it's no coincidence that this is the first Jesus film where Judas is treated compassionately after the crucifixion, rather than simply before it. Whilst I'm not sure the film has quite earned the feminist film credentials that so many have thrust upon it, perhaps its most strongly feminist element is the way that it is Mary who comes out as the bold, flawless, creative and original visionary in contrast to a Jesus who is a misguided dreamer. and weak leader. The film is beautiful to look at, and its unhurried rhythm gives viewers plenty of time to think about Mary's more compassionate vision of faith and whether she has something to say to us too. Thanks for this Matt. I will go and see it now! Did you get to see it Sally Ann? It's back again at the Phoenix over Easter weekend. Thanks for the review. Now I know that I do not want to waste my time seeing this movie. It sounds like it's attempting to diminish our Lord, and is yet another feminist movie. And it's based on speculation and Biblical innacuracies. As a woman, I'm offended by this on so many levels. Thanks for your comment and I guess I'm glad that it's been useful. I would say though that i don't think the movie is attempting to diminish Jesus, if anything it seeks to demonstrate how progressive his views are in contrast to those around him.